The back cover of their legendary album London 0 Hull 4 summarizes the orientation of many of the songs written by these indie rockers from Hull: 'Take Jesus - Take Marx - Take Hope'. 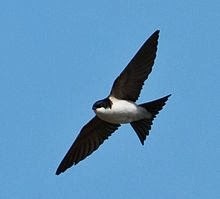 A house martin (Latin name: Delichon urbicum) is a bird like a swallow. There is not much more to tell about it here, other than that it often occurs in family crests; usually the presence of our little feathered friend indicates a coat of arms of the fourth son of a nobleman.